I really loved the Reading Terminal Market – a hybrid of a farmer’s market, food court, and a large group of Pennsylvania Dutch establishments. There was not a day that went by that I didn’t mender over for meal, snack or a treat. I managed to try an astounding number of places over the course of ten days. Dienner’s Bar-B-Q Chicken – I sat next to some people eating some tasty looking fried chicken. I found out later it was probably from Dienner’s. I got one fried wings and one rotisserie. Both were good, but over seasoned. Beiler’s Bakery – I had one of their famous Amish sticky buns. The smell from the warm cinnamon roll is hard to resist. The topping was good, but I found it a little doughy. Dutch Eating Place – it’s not the most original of names but they made excellent breakfast sandwiches and the best home fries. They were so good; Steve deviated from his standard Dunkin’ Donut toasted bagel breakfast for a $1.75 order of potato deliciousness. Smucker’s Quality Meats & Grill – I liked my sausage egg and cheese sandwich, but I think Dutch Eating Place is far superior. Sweet as Fudge Candy Shoppe – I tried their dark chocolate caramel sea salt fudge. I thought it was quite good. Tootsie’s Salad Express – After a week of indulging and nary a vegetable in sight, I went to this unexciting salad bar. I wouldn’t recommend it, unless you are really desperate for roughage. 12th Street Cantina – I got a pork carnitas burrito. They didn’t put sour cream or guac on it and they didn’t finish it on a press. Meh. Beck’s Cajun Café – I read that the sandwiches were great, but my catfish po’boy was disappointing. The fish was fine, but the bread was tough and chewy. Kamal’s Middle Eastern Specialties – I got a falafel wrap, and like my burrito it was meh. Bassetts Ice Cream – I tried the Pralines and cream and I thought it was far too sweet, certainly not worth waiting in line for. Flying Monkey Bakery – I got Steve a Guinness cupcake, which he enjoyed and I liked the lemon raspberry one I had. Chocolate by Mueller – I tried some truffles that Marc had purchased. Perfectly reasonable truffles, nothing special. Sang Kee Peking Duck – Marc was told to get the triple dumpling soup, so we did. I never figured out why it was called that, as there were only 2 types of dumplings. But, the soup was delicious and I went back later in the week to try the wonton noodle duck soup, also quite good. DiNic’s – It was currently featured on Man v. Food and so the lines were out of control. 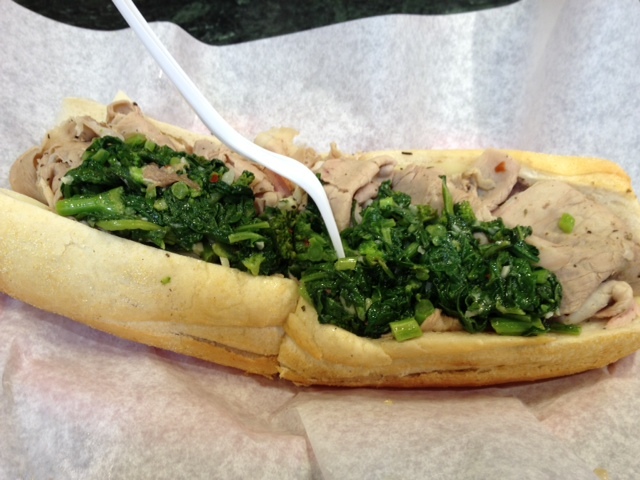 But I knew I had to try their signature roast pork with provolone and broccoli rabe sub. It was outstanding. The sandwich was large enough to make a second meal of later. I would ask for double greens, since I love the bitterness of the rabe. I agree - this was one of the highlights of having nationals in Philly. I'd love to work near this place. I also tried an Italian place that had really great philly cheese steaks. They used real mild provolone cheese which completely melted away. The steak quality was very good. The size was large like Dinic's. Someone else in my party got a Stramboli there and said it was good. I went to Dinic's 3 times before I got the sandwich you got. The first two times they were sold out! I almost tried the Scrapple at the Amish place - well, something to look forward to for next time.